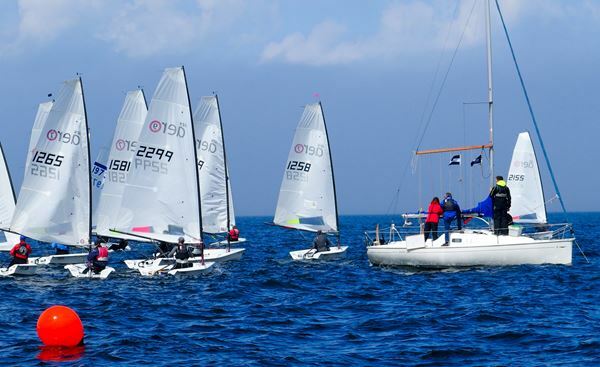 Four local RS Aero sailors plus a small but dedicated band from Yorkshire and the Lakes turned up for the ELYC annual regatta incorporating the third event in the Northern traveller series. With a fairly light forecast three of the four locals opted for the 9m rigs with all the visitors opting for 7s. Saturday morning the sun was shining and a steady 8-10kts was blowing from the North Sea - perfect conditions….until a thick bank of haar obscured the Bass Rock and threatened to blanket the sailing area. Club Commodore and PRO Robbie Lawson wisely delayed the fleets on the beach on safety grounds. After an hour or so delay the fog receded (though never entirely disappeared), courses were laid and racing got underway. Race officer on the singlehanders course Kenny Laing set a trapezoid for the first two races. The first gun saw Iain McGonigal of ELYC in his 9 rig dive in at the last second at the favoured pin end from a port tack and never look back, building up a significant lead by the windward mark and extending it throughout the race. Unfortunately most of the visitors had not read the SIs carefully enough, passing the wrong side of the committee boat on each lap and were therefore disqualified. This was firmly blamed on Steve Fraser’s (ELYC) ‘rubbish sailing instructions’ but a close perusal proved that they were in fact quite clear (at least to the local sailors! ), Angus Boyd (7 rig, ELYC) took second on handicap and Steve Fraser (9) third. 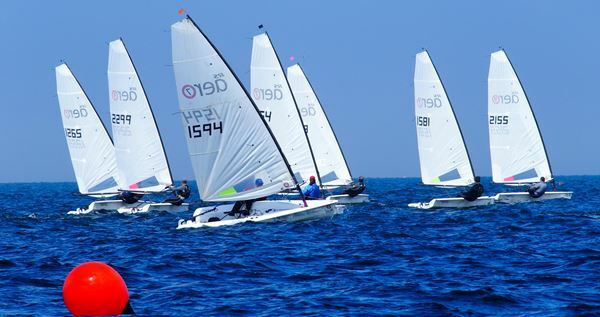 We all know you should never try the same thing twice but, ever-hopeful, Iain tried the same thing again for the second start but the rest were ready and Nick Craven of Yorkshire Dales firmly closed the door, forcing Iain outside the pin mark and to the back of the fleet. A few places were made up by the windward mark but the 9 sail really paid off on the reaches and downwind and Iain was able to get through to the front of the fleet and build a lead. Peter Craggs (7, York RI) took second and Angus Boyd 3rd. Capsize of the weekend went to John Wilcox (9, ELYC), who tried to duck past Stevie Stewart (YDSC) on port when everything went wrong at the same time and John went in spectacularly to windward. The third race started but just as the leaders reached the windward mark there was a deafening crash of thunder and lightning right overhead, and the rain began to pour down. Race Officer Kenny Laing made the wise decision to send the fleet home on safety grounds. Saturday night turned out to be rather an epic; after dinner and a couple of drinks in the club, Julie Archer of Ullswater YC decided that some fresh air was needed. Nick and Jackie Craven, Stevie Stewart and local sailor Iain McG headed out along the beach on a lovely evening to the Herringbone in North Berwick. 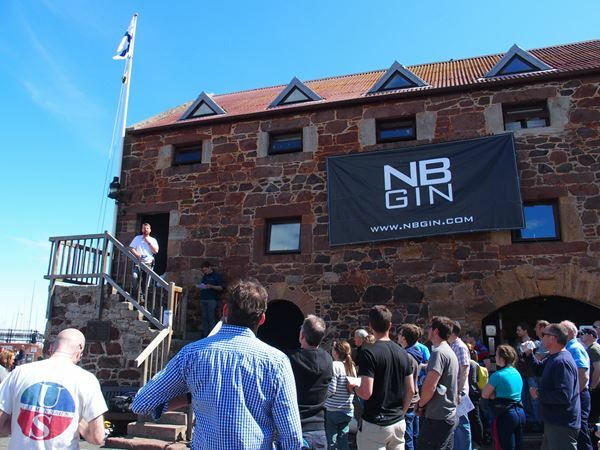 As the gins and rums flowed, Steve’s rubbish sailing instructions were duly put right (short words and big writing needed for the Yorkshire folk), and a wedding was arranged between Stevie Stewart and Julie Archer (it will never last, but the stag night will be brilliant). Sunday dawned bright and sunny - far too bright for the rather fuzzy-headed crew who were out the night before. The wind was in the West this time, and much more variable in direction and strength giving a different challenge from the previous day. The fleet launched on time giving time for four races. With a light breeze Kenny set a short trapezoid. Iain McG once again got away well from the port end and established a lead which proved enough to take the handicap win. In a very short race Angus never fully recovered from a poor start so second went to Steve Stewart and third to Peter Craggs. Race officer Kenny did a great job of altering the course quickly between races as the wind shifted around, and soon the fleet was away on a much longer ‘triangle sausage’ course. The tidal flow was building down the course and the wind shifting around so plenty of gains (and losses) to be made. Again Iain got to the front in the 9 rig and managed to build up enough distance to take the handicap win, with a consistent Angus Boyd 2nd and Steve Stewart 3rd. That was the end of Iain’s run of success - at the start of race 5 he made a complete dog’s breakfast of trying to pinch in at the pin end and ended up fouling several sailors and retiring shame-faced to wait for the final race. The 9 rigs of John Wilcox and Steve Fraser led on the first downwind but Peter Craggs stayed further inshore and picked up a huge shift and about 20 knots off the land. He went screaming past them in his 7 rig, much to their disgust. Although the 9s got past him again Peter took the bullet on handicap. In the final race the wind turned really shifty and variable. Iain McG and John Wilcox took turns at the front in the 9 rigs with John eventually taking the line honours, however Stevie Stewart and the consistent Angus Boyd in their 7 rigs were never far behind and took the one-two on handicap. Competition was fierce for the ladies prize, with Julie Archer just edging out Jackie Craven by two points over the weekend. This was great event with varied sailing, and a fun social side. 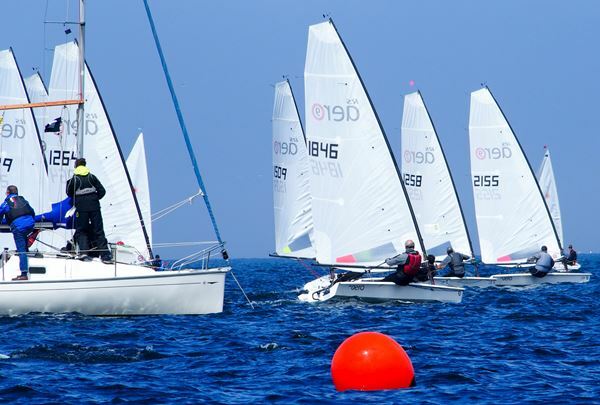 It is a pity more travellers didn’t turn up to experience sailing at the 2019 Nationals venue. Heartfelt thanks to the travellers Jackie, Nick, Julie, Peter and Stevie for making the effort to come up for the event. Thanks also to the ELYC volunteers on committee boats, rescue, mark laying, admin, bar, the excellent beach team and Andreas and his team in the Sail Loft Café. The Northern Circuit is sponsored by Green Frog Genovate - thanks to them for putting up some great trophies and prizes. Next up on the 2017 Northern Circuit is the Filey Regatta on 17/18th June.